China’s biggest tech firms are making big bets in Silicon Valley. Will it work? For the past four years, Chinese tech giants Alibaba and Tencent have been betting heavily on American startups, investing almost $2 billion in more than 60 companies. Will the investments pay off? Silicon Valley gurus encourage young entrepreneurs to take risks and invite failure, which can be a tough sell for stockholders, investors, and venture capitalists. It’s been suggested that as many as 93 percent of firms hatched in Y Combinator, a prestigious startup accelerator which has incubated companies like Reddit, Airbnb, and Dropbox, don’t last. Worse yet, that program has just a 5 percent acceptance rate. Yet Chinese companies aren’t deterred. Tencent has established satellites in Silicon Valley and New York City to scout up and coming companies. Its biggest bets so far have been a $60 million minority stake in Snapchat, the picture messaging service adored by American teens, and a $35 million contribution to a funding round for Weebly, a website publishing service which raised $127 million in its initial public offering on the New York Stock Exchange in 2013. Marc Andreessen, who at 43 is one of the elder statesmen of the valley (he helped develop Mosaic, the browser that popularized the web, when he was 21), sees Tencent and Snapchat as kindred spirits: the picture messaging service could copy Tencent’s model of add-ons and become a full suite for social media services – tantamount to Facebook and Twitter. Elsewhere, though, many of Tencent’s investments have cratered. The company had high hopes for e-commerce venture Fab.com, which allows users to upload and share design products and inspirations, putting down $150 million in support in July 2013. At the time, the company looked forward to a $1 billion valuation – and had already raised $310 million toward that goal. Last November it finally sold – to Irish manufacturer PCH – for just $15 million. PCH CEO Liam Casey hopes to turn the beleaguered brand into “the Netflix of design.” That will be an uphill battle. Meanwhile, Alibaba, which enjoyed the largest global IPO in history last September, raising $25 billion, has also set its sights on Snapchat. Earlier this month, Alibaba agreed to invest $200 million in the burgeoning social media company at a $10 billion valuation. 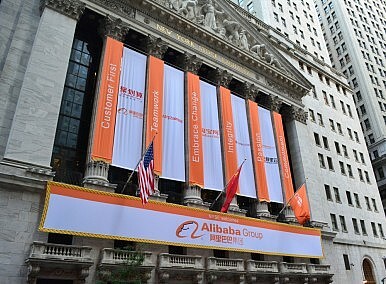 Part of Alibaba’s interest in making that bet stems from Tencent’s dominance in the messaging industry inside China. Through Tencent’s massively popular WeChat platform, users can send money, book cabs, post photos, and connect with business contacts. Overall, Alibaba has invested more in fewer companies, putting money into just 11 American ventures in the past four years. They’re hoping that ShopRunner, a delivery service similar to Amazon Prime, could be a hit with consumers (they invested $206 million in 2013). Other investments seem to be a direct push against Tencent’s stranglehold on chatting and cross-platform services. Tango, which allows users to message via voice and video, soaked up the most of Alibaba’s money, $280 million, while ride-sharing app Lyft, Uber’s much smaller competitor, got a $250 million cash infusion. Will these ventures be successful? Like anything in the valley, it’s tough to make an educated guess. Today’s bubble companies can go bust tomorrow. Many of the companies mentioned here, even if they’re successful, may not exist ten years from now. This arms race won’t be decided by whoever has the biggest guns, but by who can make the smartest decisions. From manufacturing to internet companies, China is shedding jobs across sectors.